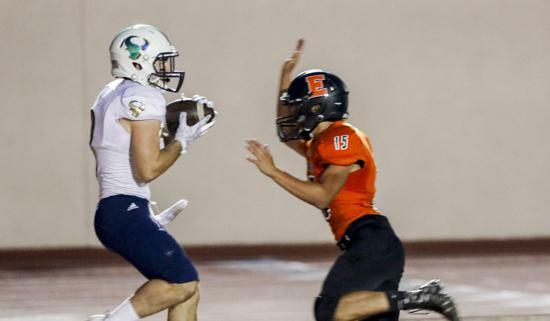 La Costa Canyon wide receiver Zach Goodkin pulls in a 21-yard touchdown pass from quarterback Jake Neufeld as Escondido’s Wesley Huizar tries to defend. Goodkin also had a 61-yard run for the Mavericks. ESCONDIDO  La Costa Canyon remained perfect. A week after being upset by Mt. Carmel, which lost in last year’s San Diego Section Division II final to eventual state champion Rancho Bernardo, the Mavericks retained their winning ways against the Cougars. Thanks to a 40-14 nonleague football victory over Escondido on Friday night, La Costa Canyon (2-1) has beaten the Cougars (1-2) all eight times they’ve played each other. Mavericks junior quarterback Jake Neufeld led the way with three touchdown passes and he ran for a score as well. Neufeld was 10 of 14 passing for 158 yards and the three touchdowns as the Mavericks bounced back with 416 yards total offense for the game. Six different Mavericks scored touchdowns in the rout. Courtesy of an interception by Mark Roberts deep in Mavericks territory, La Costa Canyon needed just two plays to cover 94 yards with Brett Peuschel covering the final 33 yards for a touchdown in the first quarter. Zach Goodkin’s 61-yard run set up the TD. The Mavericks opened the second quarter with a quick four-play, 45-yard drive for a 13-0 lead as Neufeld hit Goodkin for a 21-yard scoring pass with 11:53 left before halftime. La Costa Canyon took 10 plays to cover 80 yards for its third score, which came on Neufeld’s 1-yard sneak with 3:33 left in the first half, pushing the lead to 19-0. That gave a visitors a 234-73 edge in total yards in the first half. Three touchdowns in the third quarter by the Mavericks — a 9-yard TD pass to Tanner Clark and a 38-yard scoring pass to Jake Cashman plus a 52-yard TD run by Karson Lippert — ended any hopes the Cougars had of mounting a comeback after Kevin Rodriguez’s 1-yard TD run in the third quarter had cut the deficit to 26-7. By the end of three quarters, the Mavericks were in command 40-7. Escondido added the game’s final score on Miguel Rocha’s 17-yard TD reception from Kellen McCoy with 9:07 to play.